Well, we got out of jail on that one then. Without Gabbiadini, Saints looked very lightweight. Once again we were undone, by a complete inability to convert our chances. The saving grace was that Bournemouth's forwards looked even more inept. Barn doors and banjo's came to mind. Having said all of that, it was a game I really enjoyed, plenty of end to end stuff and last ditch defending. Eddie Howe's post match interview was hilarious where, according to him they totally dominated the game, but just a casual glance at the stats on here tells a completely different story. 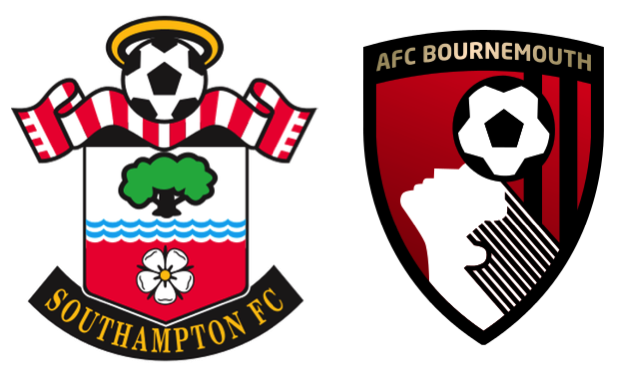 To those that were there, Saints were the better side in the first half and Bournemouth were better in the second, but a 0-0 result was probably all that either side deserved. In the game itself, Fraser Forster showed all that is good and bad about him at the moment, at one point in the first half he came out for a ball that he had already lost causing chaos in the Saints defence and only succeeded in flattening Stephens, who then needed a lengthy period of treatment. In the second half Forster pulled off a great save from Harry Artur, who's penalty shot earlier had endangered a Flybe plane taking off from Eastleigh, rather than than the Saints goalkeeper. Thinking of inconsistent performances, you didn't have to look any further than Dušan Tadić, who BT declared as their Man of the Match. Yes, he managed to hit the post with one deceptive shot, but he also failed to link up with the other forwards. My thought was that Ward-Prowse should have remained and Tadić should have been replaced by Boufal in the 63rd minute. As it was, he stayed on until the 80th minute, when he was replaced by Sam McQueen. By then the damage was done and Saints had lost the midfield. Bournemouth used their well drilled two banks of four in defence, but in the early stages, Saints were able to penetrate them with apparent ease, yet still didn't manage to make Boruc work that hard. I must own up to glancing wistfully at Boruc and wondering how much better we might be with him in goal, rather than Forster, but that's another story. Romeu was superb at the heart of Saints, running the midfield with JWP and Davis. After JWP's substitution in the second half things started to go awry in the second half the Spaniard was like the proverbial Whirling Dervish. He was everywhere, handing out very firm tackles to anyone wearing Bournemouth's blue away strip. The trouble was that he couldn't be everywhere at once and from the 70th minute onwards, when Jack Wilshire came on for the Cherries, gaps appeared which the visitors were quick to exploit. Some of Saints defending verged on the desperate, but it was ultimately effective. I was particularly impressed with Jack Stephens, who has turned into a decent CB this season. As somebody else pointed out, he still has issues with his heading. Often in that last half hour he tended to head straight up, with result that the pressure was not relieved, but with the ball at his feet he is good and some of his tackling was top notch. Well, the Bournemouth players probably had a notch, or two on their legs. Cédric was another who impressed yesterday, a lot of the good stuff going forward was down to him on the right, but as we lost the midfield later on he was having to spend a lot of time defending, so tended to fade from view. The other FB was less impressive. I can't say that Bertrand did anything wrong, but he was less influential than normal and his body language just seemed to be of someone who was not on top of things. Maybe motivation was a factor. Of the forwards, JRod was trying hard, but he just hasn't looked like regaining anything like the form he was in before his injury and that was a long time ago now. Redmond was running his socks off, as usual, but he looks less effective without Gabbiadini. In fact, what we miss about the Italian, is not just his undoubted skill in finding space for himself - look at his second (or third?) goal in the Cup Final - it is the way he makes room for his team-mates and I think that Redmond is the chief beneficiary of this. As for Long. I really don't know what to say here. He replaced JRod on 63 minutes and contributed what? I don't remember anything of value. This was not entirely his fault as by then, nothing much was coming forward and we didn't seem able to hold the ball for long. Apologies for not doing a Spot style blow by blow account, but this was not a game for that sort of report. It was a very busy, end to end game, but without any ultimate product. The nearest we had to that was the penalty. In one of the periods of Alamo style defending from Saints the linesman flagged for an infringement and the referee, Jonathan Moss hesitated and then pointed at the spot. Watching the replays it appeared that Bertrand had held Fraser, but I was a lot further away than Mr. Moss. Whatever, Harry Artur stepped up and as he was about to kick the ball, his standing left foot went from under him on the loose turf and the ball went into orbit. This was exactly the same result as Kane's missed penalty during the Spurs home match just after Christmas. Coincidence, or Conspiracy?! Anyway, a draw neither helped, nor hindered either side and both remain in 10th and 11th in the league on the same number of points, although Saints do have two games in hand. Although Tadić was BT's Man of the Match, without a shadow of a doubt, mine was Oriol Romeu for the shift and a half that he put in. He grows in importance for Saints with every passing match and is a privilege to watch. 2016/17 Signings Enter description here. Premier League Home Enter description here. Premier League Away Enter description here. Europa League Enter description here. EFL Cup Enter description here.